To find inspiration and examples of good practice, we briefly investigate the moving image culture in historical context with examples of silent films, talkies, studio systems and important musical styles. Movies are storytelling tools. With sound (depending on genre) the stories can be more immersive then without. First there were films without any music, then music played by live musician and later audio was recorded and played in sync with the film. Styles of film music have evolved with the audience’s appreciation and understanding of music in general. In the beginning, the music was romantic, later jazz, atonal music, pop music, electronic influenced music and today, audiences are used to a variety of possibilities e.g. fusions of different styles. 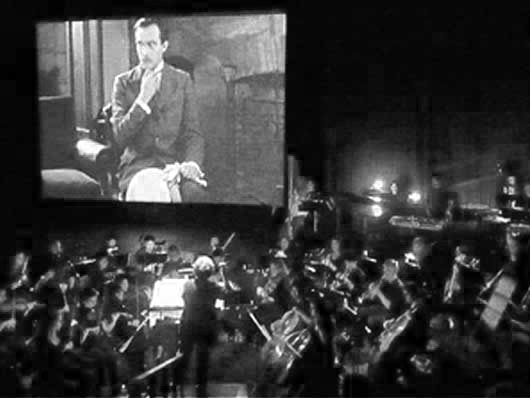 Silent films are not really silent, music, that wasn’t specifically composed for the film was played by musicians live in the theatres. Big cinemas’ had orchestras, small ones maybe only a piano player. Many silent films were simply screened as teasers at beginnings of entertainment events. Later, sheet music with different moods to fit film cues from was played live by bands (Motion Picture Moods). L’Assassinat du Duc de Guise was the first film where music was specifically composed for a movie. There are still silent films made today e.g. The Artist (2011). Imagine that you are asked to make music to a silent film from the 1920s today as an experiment! Would you stick to the style from that era or would you experiment with something completely new, modern or perhaps a fusion of the two? Technology advanced and allowed the marriage of sight and sound. Frenchman Auguste Baron uses Edison’s phonograph, also called gramophone to synchronise sound with picture in 1896. Manual sync, not perfect. The problems are, sync issue and amplitude. In 1919, German scientist manage to record audio waves to electricity. Now audio is recorded in sync with the film, but still not loud enough. Lee Dee Forest invents optical sound with the Audion vacuum tube for film. This can amplify the Tri-Ergon sytem. Success! There were no feature films made, just short films. Further info here >3.30and here. All studios were doing good business with silent movies, but not Warner Brothers. As an experiment they incorporated sound and it turned out to be a great success. First, they screened Don Juan with synchronised sound effects and music, then Jazz Singer, with (some) synchronised dialogue as well. WB used the Vitaphone by Western Electric instead of Forest’s Audion as it provided better sound quality. A vitaphone in essence a record player syncronised to film. More here. The first movies where people were talking are called talking pictures or talkies. 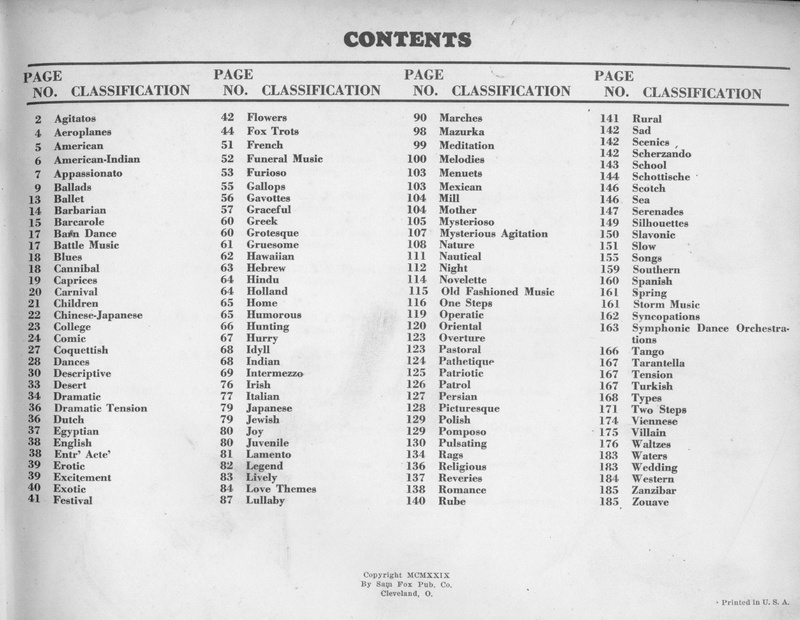 silent films are more universal (England > Hungary > China?). Some believed that talkies lacked the artistry of silent films. Conversation on this topic can be found here, a movie about Chaplin’s life, ‘Chaplin’ (1992) played by Robert Downey Jr. here and Chaplin writing about his rejection of the talkies here. Also, Aldous Huxley, author of Brave New World condemns talkies. Read more about this and the future cinema with ‘smell’ here. Rercording technology developed to allow good quality sound to be recorded separately to the film. It is called dubbing when music, dialogue and sound effects are mixed together. The stereo was introduced by Columbia’s Studios in 1931 and surround sound in 1952 by Fred Waller’s Cinerama system with 20th Century Fox. The surround system cost too much to be implemented in many cinemas, however, it has shown how much different the sound experience can be to a home TV setting. Music in films ‘had to be seen’ as well. Producers felt a need to explain the music with some visuals so they made the music diegetic. Music with a scene played in a cafe or nightclub was easily justifiable, however, a wandering violinist in a forest playing a romantic melody while the actors are kissing looks a bit weird to our eyes nowadays. Producers felt that the audience wouldn’t accept music that is not visually present in the movie. Of course, this wasn’t always the case, some directors were experimenting. Check the difference between diegetic and non-diegetic sound! More on audio technology developments can be read in ‘The History of Sound in the Cinema’ here article. This period of time is also called the ‘Golden Age of Hollywood’ and was the most productive time in the history of film - many films were made. 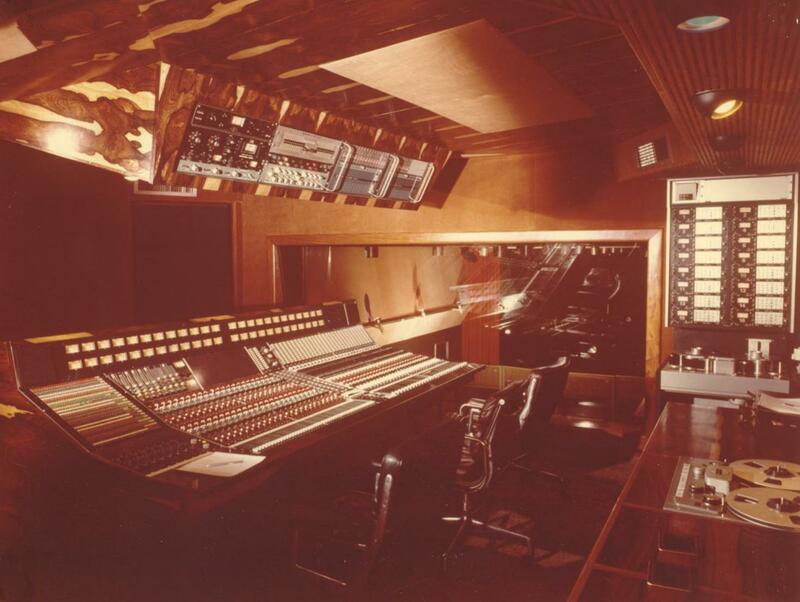 The ideology of studios, “If it works, do it again!”, was implemented in ‘in-house music studios to streamline music production. Many people went to movies at least once a week in America, so there were many movies to be made. Often a composer had only five days to compose a whole score - today a film music composer could have about eight weeks for one movie. When is your deadline? Well-trained European composers flew to America, many times escaping the Nazis. (Were European composers better trained than American ones?) Contemporary music wasn’t used in films as it was a bit too alien to the audience - the music of Stravinsky, Bartók, Schönberg wasn’t familiar to people who went to cinemas. Classical music’s harmonic structures are easier understood by middle-class people who were visiting the movies the most. Musical themes, leitmotif started to be attached to characters - repeating motives reinforced the audience’s understanding of the plot. The music in general was romantic, lush (Davis, 2010). What are the most popular types of movies in the cinemas nowadays and who are the audiences? Also check Erich Korngold. A documentary. Producers introducing contemporary classical composers e.g. Stravinsky, Bartók, Schönberg to their films. There were more experimentations with dissonance, atonality, popular, jazz and rock ideas. 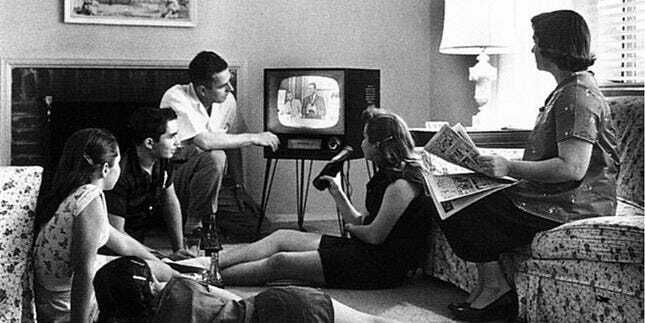 From the beginning of the 60s, people started owning TVs at home. This wasn’t good business for film studios and cinemas. For a few years, studios didn’t allow their movies to be shown on TV. However, later they gave up and started producing TV shows, sit-coms in their studios. Also, this was the time when theme songs became more significant in films as studios could collect royalties when the music was played on the radio. They could also sell records, the soundtracks of the movies. Some examples: The Pink Panther (1936), Batman (1960), Dr No - James Bond (1962), Bodyguard (1992). A movie that started breaking the rules with technological improvements >1.00, short 5-15sec musical cues instead constant background music. More about this in this essay. Trailer to the movie. … North’s score combining blue-tinged jazz melodies and harmonies with increased dissonance levels, melodic angularity and economical chamber textures, thereby encapsulating four of the most important film-score trends that increasingly asserted themselves during the 1950s” (Cooke, 2008). This movie is based on the book by John Steinbeck. In East of Eden, Rosenman introduces more dissonance. Apparently, this movie has helped the audience to accept different, more contemporary music. Clip here >30s. A big epic stlye movie, based on a biblical story. Music is romantic, has more conservative scoring. (There are more biblical movies in this time period.) Clip here >20s. The film, which began the trend of using pop lyrics to suggest a character’s otherwise unvoiced preoccupations represented the first attempt to integrate multiple non-diegetic songs with a linear narrative (REF needed). Clip here >30sand here, trailer here. Fully electronic music. An article with a short film here >. Multitrack recording and overdubbing made life easier and provided room for creativity. Big lush orchestras are reintroduced for scoring films, TV series are jazz and rock flavoured. 12 tone compositions became popular to create tension, which was not too alien as experimentations by earlier film composers have prepared the audience’s ears. One of the movies where the traditional orchestral sound came back to the cinemas with a leitmotiv. A simple pulsating semitone figure played on strings to create a feeling of terror. Clip >40s, article here. John Williams has made our movie more adventurous and gripping than I ever thought possible (Steven Spielberg). Temp music was The Planets (1916) by Gustav Holst. Does it sound similar? Listen to it later… The music of Star Wars changed the way audiences thought of orchestral music. It popularised it. What about its sound design? Interview > with Ben Burtt and the secrets of Star Wars’ sound design. The use of synthesizers becomes popular (and blending them with traditional sounds). The entirely score is electronic and is lyrical, harmonic in a general sense. Earlier electronic sounds were mainly used in sci-fi movies and high-intensity dramatic situations (Davis, 2010). This score has changed the way directors thought of electronic instruments used in movies. Trailer here >, documentary here. Can you think of films with wordmusic and pop influence orchestra? Chion, M,. 1994. Audio-Vision, Sound on Screen, Columbia University Press. Copland, A., 2002. What to Listen for in Music. Signet Classic. Davis, R., 2010. Complete Guide to Film Scoring. Berklee Press. Karlin, F. and Wright, R., 2004. On the track, Routledge.